My Nightmare’s Wear White is a courageous reenactment of a young woman’s struggle with Still’s Disease . It’s playing at The Theatre Centre‘s BMO Incubator as a part of SummerWorks 2016 before moving on to Halifax in the fall. 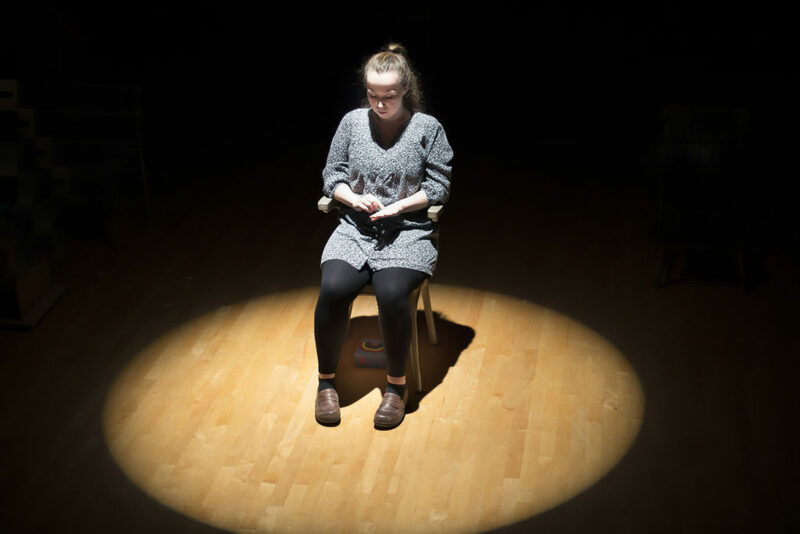 In it, the writer and performer Grace Thompson shares her experience and pain with the audience in a deeply emotional performance. In the short runtime of an hour, Thompson shares her experience from living with her debilitating condition. She also shares her profound insights on life, hardship and all manner of things. Thompson’s delivery ranges from funny and upbeat, to heartbreaking and deeply moving. This is a difficult true story being shared by the person who experienced it, so it feels very personal and I found that I really felt connected to Thompson watching her onstage. Given how personal this show is to Thompson, seeing her perform is so much more than just watching someone act. This is a person bearing the most intimate parts of herself to the audience, and this amounts to a very profound show. In my case, My Nightmare’s Wear White reminded me of family members’ as well as my own experiences with illness, surgeries, and chronic conditions. As I was watching Thompson’s performance I had vivid memories crop up; for some people that may be too much, but I found it deeply cathartic. Thompson drew most of my attention throughout the show, but I took note of the other elements as well. Maddie Bautista has a silent role, miming several other characters and showcasing some incredible movement skills. She also composed some original music that she shares with the audience. The lighting was great. My Nightmare’s Wear White made decent use of a screen. I felt like I could have watched more silhouette work though. Also, on the tech side I found the sound to be a bit off; it’s loudness didn’t match the tone of the show, especially when it came to some canned voice recordings. Of course, it was only opening night and the BMO incubator is a very echoey space. In sum, this is a deeply personal and emotional show. It really resonated with me on a very genuine level. Some very good writing and a memorable performance from Grace Thompson really elevate this production to being something special. I think that My Nightmare’s Wear White will stick with me for awhile.